When it comes to insulation contractors, you want the very best to be working at your Mason, Tennessee, home. At 31-W Insulation, we provide just that. Our employees are highly experienced and knowledgeable in order to provide you with the right products and install them properly in your home. Improved energy efficiency – Insulation reduces heat transfer to help your HVAC system expend less energy as it maintains your home’s temperature, which can cut down on your energy bill. Better air quality – Insulation provides a seal that can reduce the amount of allergens entering your house. Less noise pollution – Insulating materials also mean that less outdoor noise is able to penetrate the peaceful environment inside your home. A great return on investment – In addition to the energy savings, insulation can add to your home’s overall value. 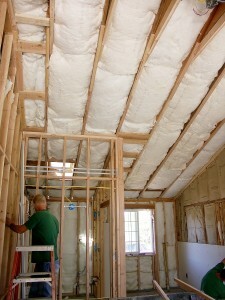 No matter where your house needs insulation, 31-W’s insulation contractors can help you. We use batt insulation products from some of the top brands in the industry so that we can provide exceptional insulation in addition to superior installation services. To learn more or to meet with one of our insulation contractors at your Mason, TN, home, contact 31-W Insulation today.